A lovely day at the V and A.
I am a little late in writing about our most recent visit to London at half term but better late than never I suppose. 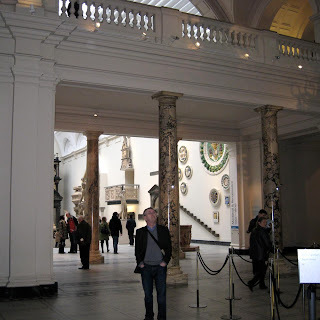 Tony and I caught the train down to Euston and stayed for three nights in the city, primarily to visit our eldest son but also to cram in as many museums, galleries and shops as we could! We managed to see the Van Gogh Exhibition at the Royal Academy, The Chris Ofili exhibition at the Tate Britain and some of the many treasures at The British Museum, but the jewel in the crown was a visit to the newly opened Medieval and Renaissance wing at the Victoria and Albert Museum. There are now ten new galleries spread over three floors, textiles, and paintings, sculptures all of which are unmissable. There was so much to see and so little time to see it in, here a just a few of the very lovely and inspiring things that caught my eye. 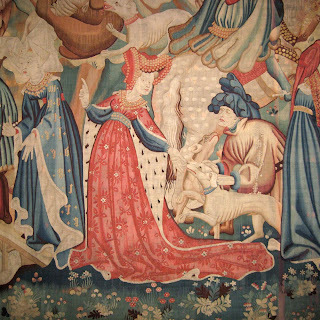 “The Boar and Bear Hunt tapestry”, see detail above, dates back to the fourteen hundreds, as well as depicting the hunt in all its gory glory, the tapestry shows the costumes and fashions of the day. The lady above is proudly displaying her coat lined with miniver, an expensive fur made from the bellies of Baltic squirells. It is thought that a coat like this would have taken the fur from hundreds of squirrels killed during the winter months. I suppose conservation was not an issue back then! Click on the images for a closer look. 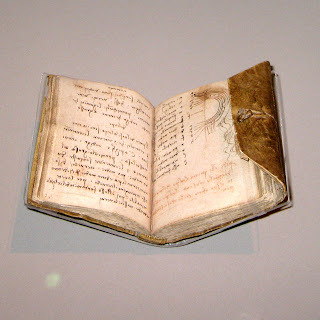 The highlight of the visit for me was this exquisite, tiny notebook, which belonged to Leonardo Da Vinci. There is something rather magical about seeing the handwriting of a famous person from the past, it retains an immediacy which the printed word lacks. I suppose it is a bit like the difference between a handshake and a text message. Eventually we had to tear ourselves away from the museum and face the horrid, cold, wintery weather outside and thought how lovely and warm the lady with the miniver coat would have been. We had chocolates, candy, acorns, shells, jelly beans, memories, plane tickets, wild flower seeds, silken thread, goji berries, tea, a tiny cookie, mini eggs, sunshine, signs of spring, a fluffy baby chick, jelly belly favourites, biscuits, cake, paper wrapped hearts, fluffy chicks and last but not least, a lost wedding ring! I was astounded by your creativity, what clever answers you came up with. I hope I have not left anybody out. All of the above are worthy winners, however I had to choose just one, mmm…. 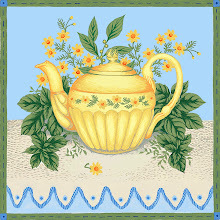 In the end I decided to let fate do the choosing, so the winner as picked by the random number generator is Judy at CJ Stitching and Blooms. So Judy, if you would kindly email me your postal address my little ducklings will prepare themselves for their long flight across the ocean. 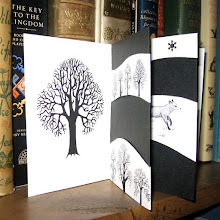 The above illustration is taken from my book "Down the Lane", it depicts a blackbird sitting on our hawthorn hedge. 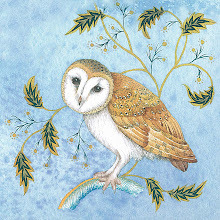 If you live in Britain you will be familiar with this adorable, gentle bird with its sweet, melodic singing. 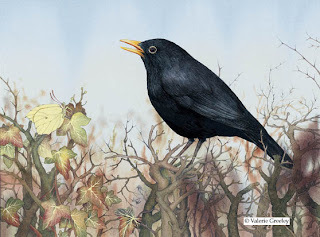 We have many blackbirds visiting our garden, they are permanent residents and as I gaze out of my window right now I can see them hopping about looking for worms. The older I get the more appreciative I am of living in a place where bird song fills the air. It is the one thing that I miss the most when I visit inner city London. I will try to get myself organized soon to show you something of our latest trip to the London galleries and museums but right now duty calls. 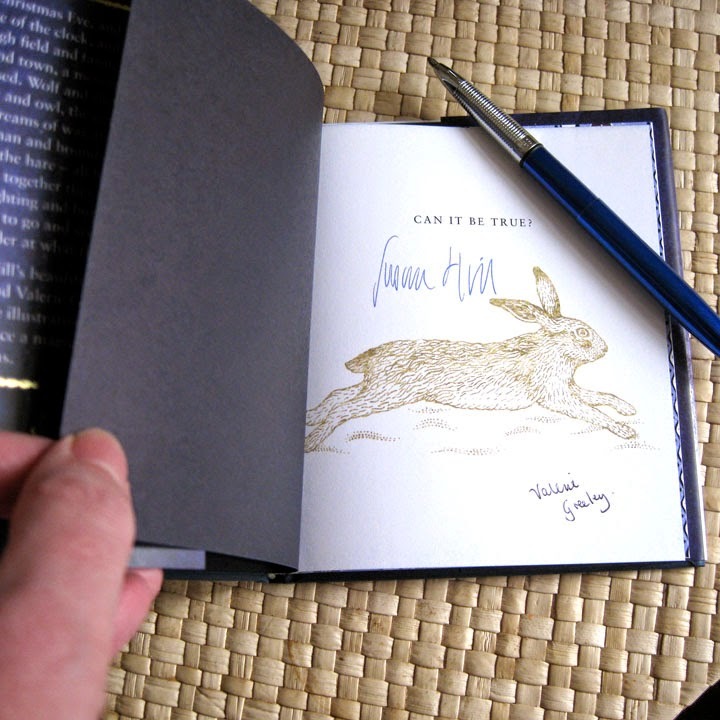 I am busy working on a new Christmas collection for Makower and I have a meeting tomorrow so I better get a move on. Giveaway and Easter Eggs now in stock! I hope you have fun filling them with your handmade goodies. So far I have seen them filled with perfumed egg shaped soaps and chocolates. To celebrate their arrival I have an egg to giveaway. If you would like to be entered in the draw please indicate your wish to join in the giveaway by leaving a comment below and tell me what you would like to find inside your perfect Easter Egg. The draw will close on Monday 22nd February. QUICK UPDATE THE BUMBLEEES WON HURRAY!!!! 11th Feb.
First of all let me thank you all so much for voting for the Bumble Bees, the voting closes at midnight tonight so fingers crossed! Also for all the thoughtful comments that you left when I had a break, it has not been an easy couple of months and I was very touched by your concerns. The Spring Fair is now well on its way this week in Birmingham at the NEC and I went over to the show to see some of my licensees and meet up with friends old and new. The show is huge so comfy shoes are an absolute must, so too is a pack lunch because the catering facilities leave much to be desired. I managed to see some of my products, some of which I have never seen before, so that was quite exciting, including some tablemats and trays. 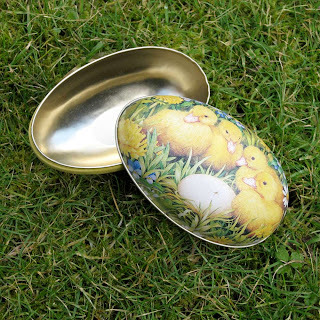 I also saw some of my Easter egg shaped metal containers on the Elite stand, I have two designs with them, one is an Easter Bunny and one is a Duckling design. 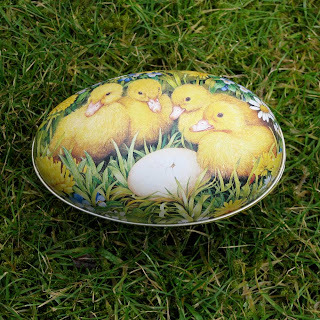 The idea is that you fill the egg with goodies such as handmade sweets, small toys or soaps and give them as Easter presents. 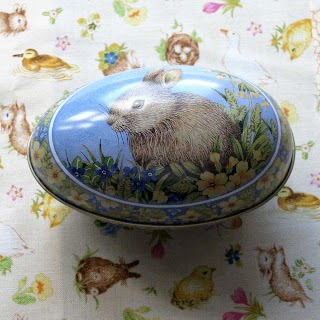 I decided to order some for my shop but alas was too late for the Bunny tins as they have all sold out! When I get the ducklings tins I shall let you know. I met up with fellow artist Judith Glover who tells me that she has a new Valentine’s Day e-card to send. (See little dog illustration with hearts). 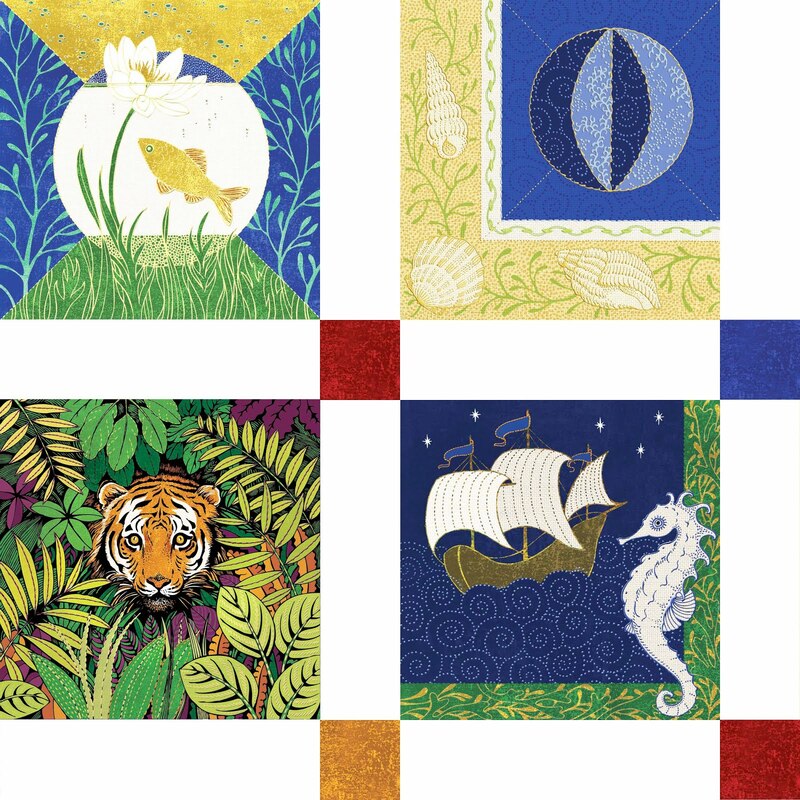 You can preview all of her cards on her website and I can highly recommend them, they are quite the nicest I have seen to date. The animation matches the music perfectly; they are a joy to behold. On the whole the show looked like a success, it was certainly busy and there was a genuine buzz about the place, maybe spring is on its way after all? One final push to help our bees! 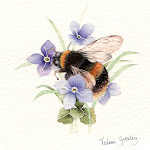 I know I said that I was taking a break but I felt that I had to ask for your help to support our endangered bumble bees. 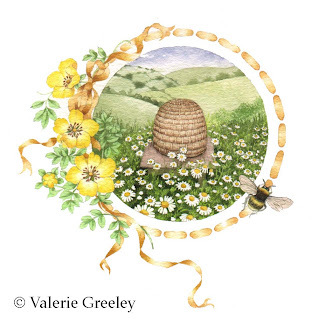 “You are TWO MOUSE CLICKS away from helping us to save the rare and beautiful Shrill Carder Bee. Our wild flower meadow conservation work is in a competition, and we need your help to try and win. We are up against some huge charities with big mailing lists, so we need all of the votes we can get! It only takes two clicks to visit the voting website and register your vote. Voting closes at midnight on the 10th February. Of course all the projects are worthwhile but without the bees many of our wild flowers, fruit trees etc will disappear along with the birds and insects and mammals that these plants support, including us! So please, please, please, help our bees.